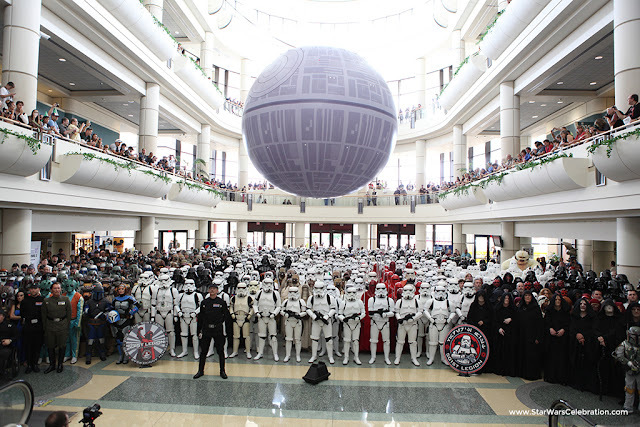 We're just a little over twenty days away from the official kick off of Star Wars Celebration Orlando! Lots of news has been breaking recently, and today several exciting things were revealed about the convention. First off, our friends at Jedi News got their hands on the full schedule for the Podcast stage which will run all four days of the convention and includes an assortment of shows. You can read the full list by clicking here. Secondly, the official Star Wars Celebration site has been updated to include the floor plan for this Celebration. With it you can find out where all the stages, booths, and other areas will be located on all four floors of the Orange County Convention Center. (Psst: vist the SWU at booth #1848.) Click here to take a look. And if you're interested in taking advantage of the free shuttle service to the convention center, information about it has also been added to the site here. And last but not least, Rancho Obi-Wan has released details on their presence at Celebration, which will include an exhibit on the show floor. You can read more about their plans by clicking here.